This post brought to you by Chamberlain. The content and opinions expressed below are that of Busted Wallet. Smart homes are getting smarter and more accessible these days but a lot of people struggle when deciding where to start or what to upgrade first. Often overlooked, a perfect piece of kit to any smart home is one most people use multiple times every day, the garage door. 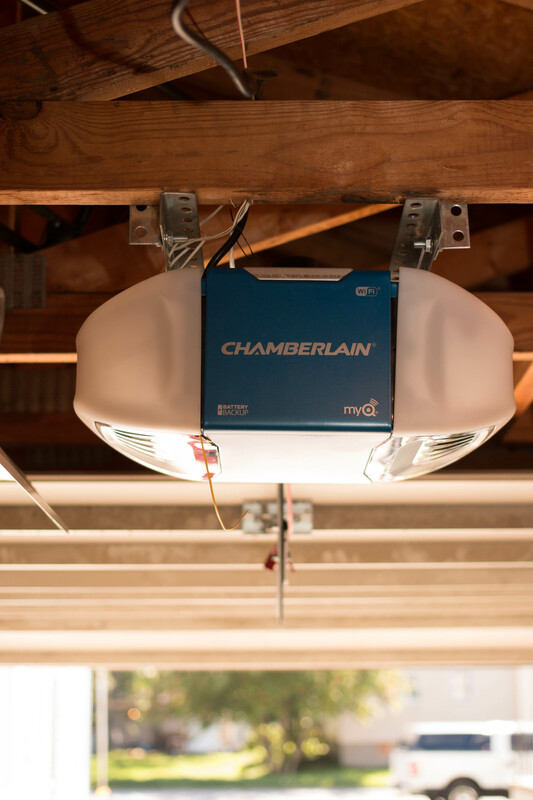 A trusted name for years, it should be no surprise that Chamberlain has brought to the market what might be the first and pinnacle of garage door opener technology in its Wi-Fi garage door opener. Packed in the MyQ smartphone controlled opener is a powerful unit with all the technology that will bring your garage door into the future while providing a dependable solution that will keep your home secure and safe even when you are away. The first step to a smart garage door is of course to install the Wi-Fi enabled opener.  Installation is a breeze and is no different than any other garage door opener, except that you will need to make sure that you have a good Wi-Fi signal in your garage. For the DIYers out there, installation is a task that nearly anybody can do thanks to the easy to follow instructions and the great YouTube videos provided by Chamberlain. Almost everything you need is in the box except for 2 light bulbs and a few brackets that you may need depending on how the unit will hang from your garage ceiling. Having a helping hand around is definitely a good idea to help lift the unit into place, but most of the bulky assembly is done while the unit is on the ground. Of course if you aren’t exactly a DIY whiz, installation services are readily available. That is the path we took for our installation and found it to be worthwhile due to a small clearance issue the installer came across while replacing our older opener. After a few adjustments by a pro, we were back in business! 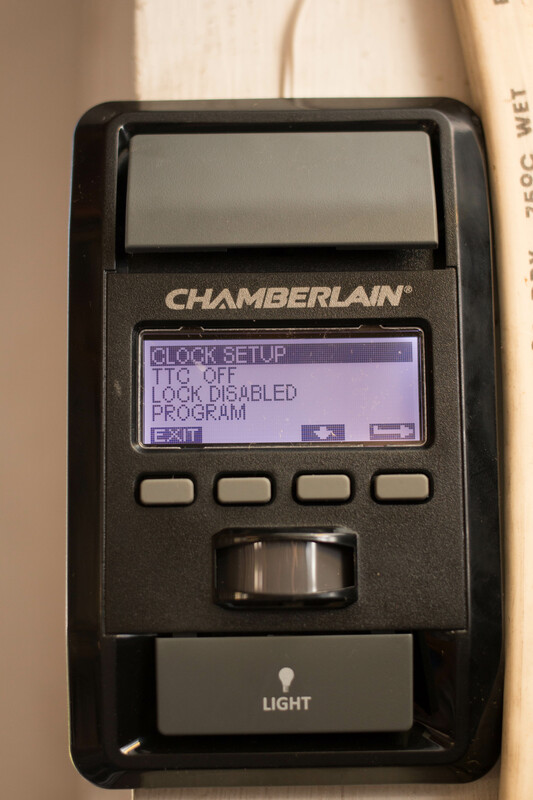 The Chamberlain Wi-Fi opener isn’t just designed to be a smart opener, it is designed to be a top of the line opener with all the features you could want. Central to this design is a powerful 1-1/4 HP motor. This strong motor means this opener can lift nearly any garage door, even it is solid wood. Chamberlain also made sure that the elements of rain, snow, heat and ice will not cause any problems when it comes time to open your garage. A steel reinforced belt drive operation means this opener is whisper quiet. We replaced a chain drive opener and the first time I heard the Chamberlain Wi-Fi opener command the door to quietly ascend, all I could wonder is why I lived with a rattling, banging creaking garage door for all these years. If you have living space attached to your garage, a belt drive is a must. If you have ever been caught away from home when the power goes out, you will also appreciate the battery backup built into the opener as well. While running on battery, the opener will continue to operate in a reduced power, but nearly full function, mode for up to about 72 hours. 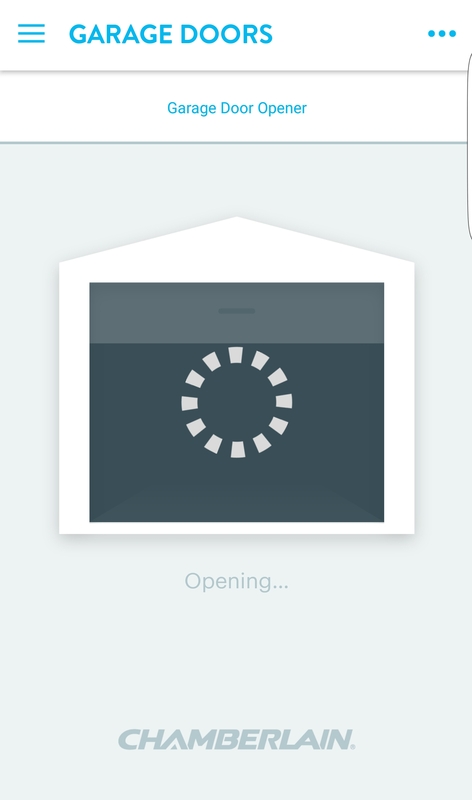 This mode will allow the opener to open and close a few times even when there is no power. It is worth noting that when it is running on battery, the Wi-Fi functionality is turned off, so you will still want to plan on having access to a traditional opener or the outdoor keypad. Garage door lighting is also well designed by including 2 side facing lights that can accommodate up to a 100 watt bulb. For most of us, the garage light is the only light in the garage so the lights on the opener are an important feature. Not only do the lights come on when the opener is activated, but there is also a motion detector to provide ample light anytime someone enters the garage. Usability of a garage door is probably taken for granted because typically you push a button on the wall or in your car and it opens. Maybe one of your buttons currently lights up, even! What else could be changed, you ask? Chamberlain took things a step further even without the Wi-Fi capabilities. The wall mounted control button has a full LCD display that displays temperature, time, battery charge status and even a full menu to help configure the door options without having to do cryptic combinations of what seems like random button pushing. Also on this display is a motion detector to control the light with even more accuracy as well as a button to turn on the light and of course a button to open the door. Also included in the box is an outdoor keypad that allows your opener to function using a set code, or even a temporary PIN that can open the door for a set number of hours or a set number of times. This is fantastic for letting in guests without having to share your full code. The keypad also has a great feature I’ve come to love and that is the “One button close” where anytime the door is open, it can be closed simply by pressing “Enter” and not having to enter a PIN. Of course the traditional remote control is also included and is fully HomeLink compatible so the buttons in your car can be quickly programmed to operate the door just as any other opener would function. But now for the cherry on top of all of these amazing features, the MyQ internet enabled Wi-Fi. 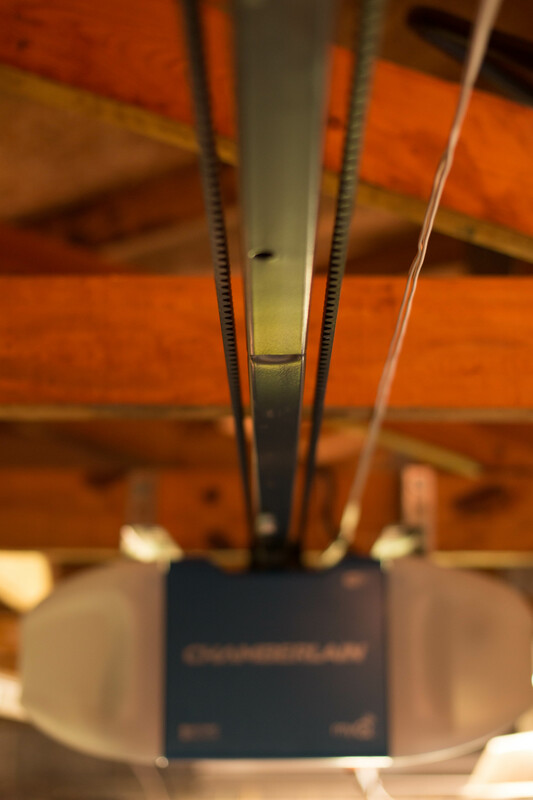 The Chamberlain opener has built in Wi-Fi that means it is fully internet connected and will bring your garage door into a whole new level of functionality. Once connected, by using the MyQ app on your smartphone or even from your computer by using the MyQ website, you can check if your door is open or closed from anywhere in the world. Arrive at work and realize you forgot to close the door? No problem, pull up the app on your phone and tap the door. 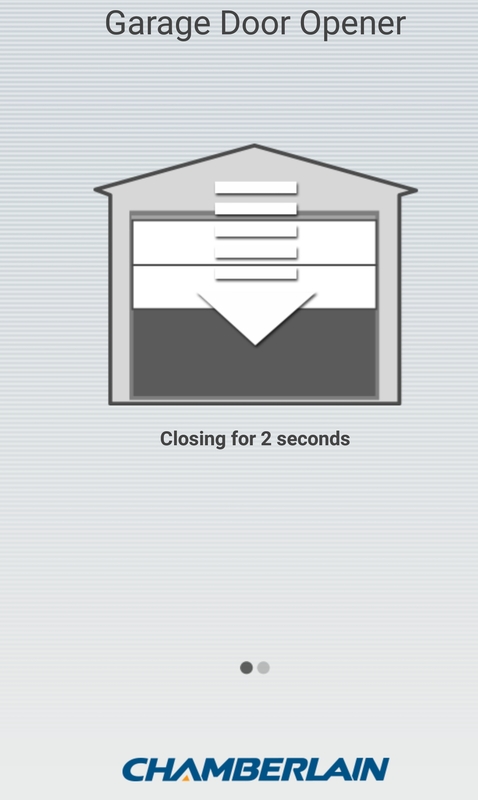 The app will show a status indicating the door is closing and finally showing that the door is closed and for how long it has been open or closed. Need to let in a guest? No problem, have them txt you when they arrive and you can remotely open the door for them. When they leave, you can combine the “One button close” feature and tell them that all they have to do is press ‘Enter’ on the keypad and the door will close. But even if they forget, you can still close the door remotely from your PC or phone. Just too lazy to get up from the couch to see if you remembered to close the door? No problem, whether you are on the other side of the wall or across the world, with the Chamberlain Wi-Fi door opener, you have total access to your garage door. With any smart home device, how it integrates with other smart home devices is key to measuring its “smartness” and the Chamberlain Wi-Fi opener has made great strides to make the smart home smarter. Inside the MyQ app, you can configure notifications so that you will be alerted immediately on your smartphone anytime the door is opened or closed. Great for knowing when the kids have made it home safely or when the door was last operated. As an official “Works with Nest” solution, you can also control your Nest Thermostats and Nest Cams right inside the MyQ app with integrations to temperature as well as Home/Away status. Other integrations include Xfinity Home and also Wink. 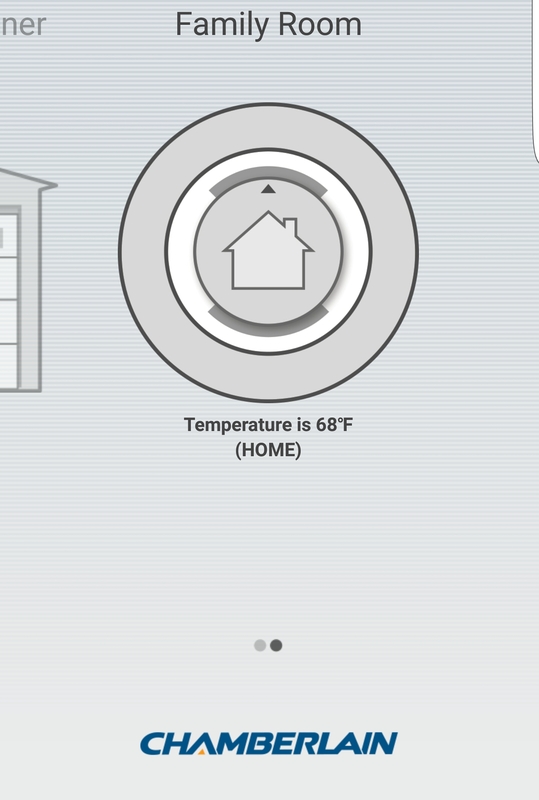 In my setup, we played with the Wink integration the most and found it to connect extremely easily and integrated nicely with full functionality into the Wink app, allowing a full smarthome control center all in one place. My favorite features are the ability to trigger Wink “robots” based on an open or close trigger. 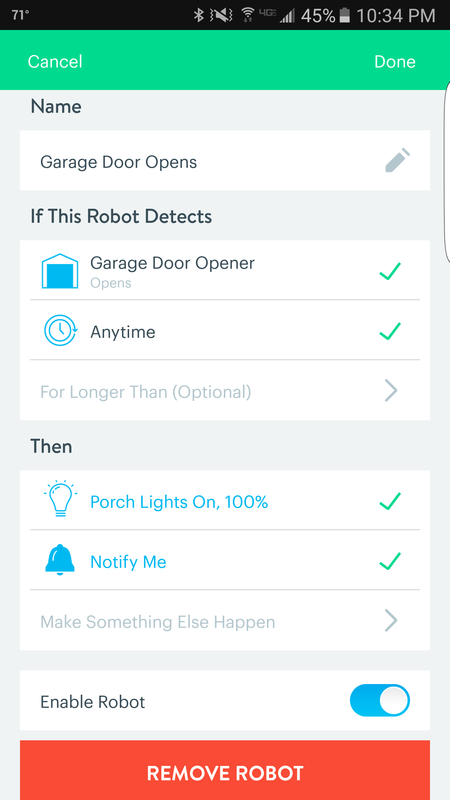 These “robots” or actions mean I can trigger my front door to automatically lock when the garage door closes, or turn on the kitchen lights when the door opens. With integration also raises the question of security, a very important topic. Chamberlain has really thought out the security by restricting available integrations a bit. By not allowing Wink “robots” to actually open the door, it means that only open requests can come from trusted sources such as the physical openers, the MyQ app or the Wink/Xfinity interfaces. While this does limit some creativity of ways to use the internet capabilities, it is simply an unfortunate necessity. However, it also means that you should make very sure to pick a good password for your Chamberlain MyQ account to ensure the security of your garage door. Of course, it is also important to point out that if you happen to lose Wi-Fi connectivity, your integrations will not work, but normal operation always continues. As long as you have a good, reliable router, you will find all of these features always at your fingertips. This is a top of the line garage door opener all around. Nothing was skimped on and the number of features is hard to beat. You definitely get what you pay for and more. 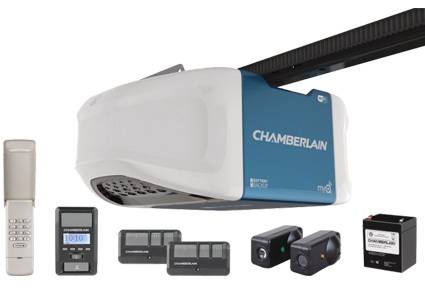 If you were to start with a basic chain drive opener and just add all the control options, you will likely spend more than the total cost of the Chamberlain Wi-Fi opener. 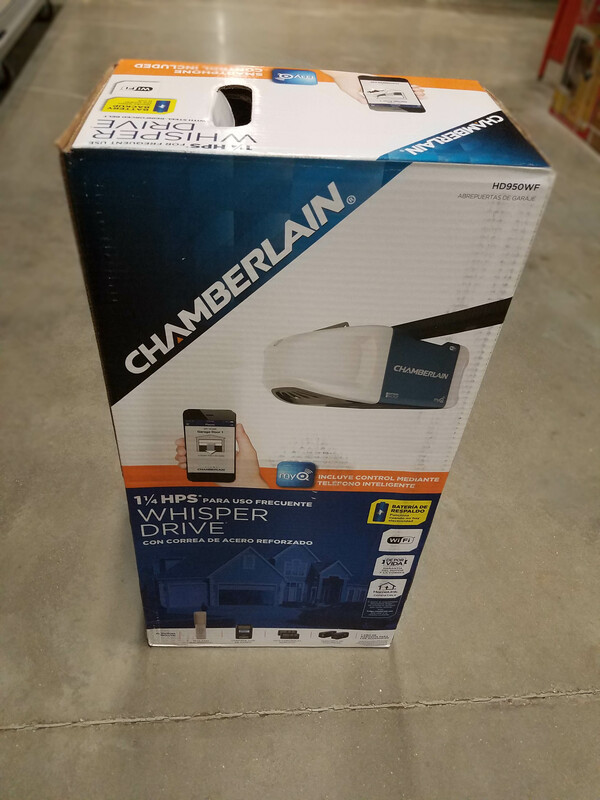 The Chamberlain Wi-Fi garage door opener is a top of the line, full featured garage door opener system that is priced to be a great value as a stand-alone unit and an even better value as a fully connected smart home device. Although it does depend on a solid Wifi and internet signal for most integrations, if your network can support it, there is simply no match for the Chamberlain Wi-Fi garage door opener. Choose a strong password; its the key to your house!